We’re seriously considering moving the dogs to a BARF (bones and raw food) diet. 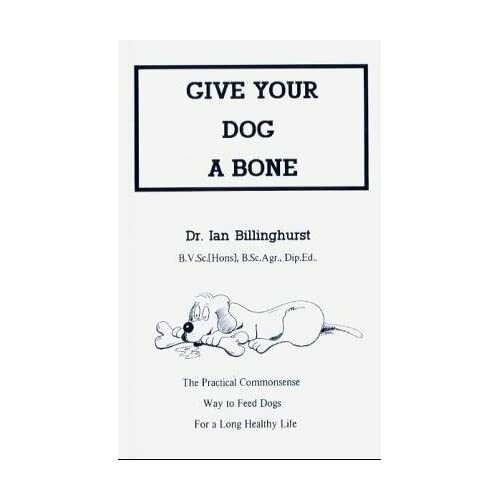 I’m currently reading Give Your Dog a Bone: The Practical Commonsense Way to Feed Dogs for a Long Healthy Life by Dr Ian Billinghurst. Our dogs get quite a few raw meaty bones already, though not as many as recommended. They are fed primarily dry, kibble type dog food with some pre-packaged meatballs and some veggies and fruit – oh, they do love their fruit. I went out and bought some of Dr B’s patties and some chicken wings today. I also thought I might see if the butcher had any rabbits. Boy, was I in for a shock! When did rabbits become gourmet game meat? $32 for a rabbit! Am I really showing my age by remembering when you couldn’t even find rabbits because the butchers couldn’t give them away? I think the pups can skip the rabbit for now. This morning we had a great walk along the Burns Beach track. Anzac, Jet and I always enjoy the walk but today was extra special. We left home a bit later (after we dropped Stephen at the station) so we weren’t under any time pressure and could walk further than usual. For the first half of our walk there was good cloud cover so that helped as well. Jet was especially good this morning. Because we were later there were none of her normal little antagonists – those pups who make snuffly noises as they walk and try to rush towards her, which literally gets her hackles up (you should see that; I must try to get a photo). She reacts badly to dogs who approach her too enthusiastically and has a specific couple she’s really developed a dislike for. She ignored all dogs this morning and just enjoyed her walk. I was careful not to put pressure on her lead and, by doing that, give her a signal that she might need to be worried about an approaching dog. I’m afraid I might have been sending her the wrong signals with some dogs. Jet was also particularly good with the bikes this morning. She really dislike bikes, or should I say spinning bike wheels, which she knows are coming when she sees a bike approaching. It’s only the moving ones that need to be snapped at and need rounding up. I’ve been noticing a positive improvement with bikes coming from behind for a while now, ‘specially those whose riders ring their warning bell. On Friday Jet ignored all bikes from behind. Today, while she didn’t ignore them, she also left all oncoming bikes to go past without being snapped at. With each bike she saw she moved off the path beside me and looked up at me, waiting. I’ve been rewarding her with a treat after the bike goes past and it seems she’s finally put two and two together. Thanks go to the Haltie collar (which has given me so much more control and made our walks pleasant again), Kim at DoggieWould Training for her great training tips and advice and to the obviously yummy ZiwiPeak Good Dog Treats from AYM Pet Supplies and More that were in our prize bags from the DoggieWould Christmas party. I’ll definitely be getting more of those! Now, if only I could stop Anzac from wanting to sniff every post, bush and mark on the path along the way! And where did he get the idea that it’s acceptable to lift his leg on so many of those posts and bushes? I know he doesn’t need to wee that often. Boy dogs! Hrmph! After seeing a link to, and then reading, this blog: http://www.abeautifulmess.com/2012/04/green-smoothie-challenge.html I’ve been inspired to have a green smoothie every day (except one) for lunch for over a week now. I’ve never been able to bring myself to drink veggie juices (believe me, I’ve tried) but I haven’t had any trouble drinking green smoothies. I use a few leaves of either rainbow chard or tuscan kale from the garden and add either frozen berries or fresh pineapple. I usually also add some unsweetened almond milk and water, and sometimes a small spoonful of almond, cashew and brazil nut butter. I also sometimes add a small banana – bananas make the smoothies nice and creamy. Today we bought some frozen coconut meat and I added that to kale and pineapple. It was very disappointing; coconut milk is a tastier alternative though I might try coconut juice/water. Some combinations I’ve tried have tasted a bit grassy, and the only ones that aren’t a green colour are the ones with berries. All in all I’ve decided that green smoothies are a yummy, healthy lunch option -even if they do break my ‘no drinking anything green coloured’ rule.